Warning: ChimeraX virtual reality (VR) capabilities have many shortcomings. A few years of development effort will be needed to make these features work well, and only a small fraction of that work has been done. ChimeraX allows display and analysis of structures and density maps using virtual reality headsets such as HTC Vive, Vive Pro, Oculus Rift, Samsung Odyssey and Windows Mixed Reality. For multi-person VR sessions, see the meeting command. ChimeraX can also record 360° movies. Molecular visualization on the holodeck. Goddard TD, Brilliant AA, Skillman TL, Vergenz S, Tyrwhitt-Drake J, Meng EC, Ferrin TE. J Mol Biol. 2018 Oct 19;430(21):3982-3996. Any models displayed in ChimeraX can be shown in virtual reality headsets supported by SteamVR, such as HTC Vive, Oculus Rift and Samsung Odyssey. 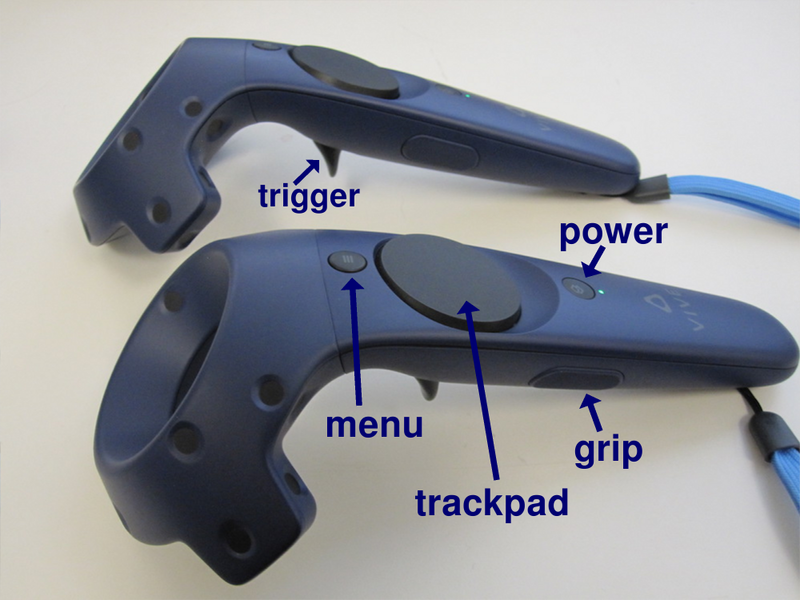 Descriptions here are for Vive hand controllers, but other hand controllers have buttons that are generally similar in position and function. Vive controllers each have a trigger to “pull” with the index finger, a grip button on the side, and a larger round trackpad on the top surface that can be pressed with the thumb. Above the trackpad is a smaller menu button marked with horizontal lines, and below it is a power button and a green light indicating when the controller is turned on. The SteamVR status window shows icons for the goggles, two controllers, and two base stations in green when they are detected as ready for use. 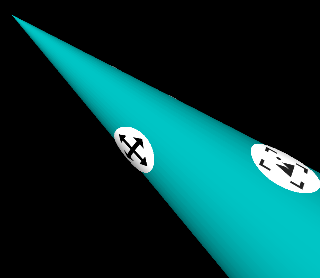 The icon on the cone “underside” shows that the trigger is assigned to translation (and rotation), and the icon on the side shows that the grip button is assigned to center and rescale. The control panel is just the ChimeraX desktop user interface (by default, the righthand panel of tool windows). Displaying this panel in the headset allows “clicking” normal desktop controls such as to adjust the display and to reassign modes. The physical room bounds are shown with blue squares when the headset or a hand controller comes close to a physical wall (within about a meter). Models can be scaled to sizes larger than the physical room. press the Vive menu button to show the ChimeraX control panel with Mouse Modes toolbar in the headset. There are three assignable buttons on each controller, so six modes can be assigned. However, leaving the triggers with their default assignments (rotation, translation, zooming) is recommended to allow manipulation as described above. If a trigger is accidentally reassigned, using it to click either the rotate or translate mode icon returns it to the default behavior. Modes that require clicking on an atom such as selection or labeling require pointing at the atom with the hand controller cone. This is easiest to do at close range, although it can work at a distance but requires accurate pointing. Modes that involve dragging on the desktop such as changing the contour level of a map or zooming are operated by clicking and moving the hand controller vertically. The bond rotation mouse mode operates by dragging on the desktop, but in VR operates by rotating the hand controller. Translation and rotation are separate mouse modes but are a single hand controller mode. An icon will pop up slightly when the cone tip is in position to click it. The scope of action of these icons can be limited by selection. Alternatively, the display can be changed by removing the headset and using the ChimeraX interface on the conventional display with mouse and keyboard. Motion sickness warning: If the model is stuttering or flickering in the headset (due to insufficient rendering speed), then you should stop viewing it, as this can easily and suddenly induce nausea that could last as long as 24 hours. Even without the stuttering, if you feel any motion sickness, stop using the headset. Progression from slight nausea to needing to throw up can happen quickly. Operating systems. We have tested ChimeraX VR on Windows 10 with an Nvidia Geforce GTX 1080 graphics card and with an AMD Radeon RX 480 graphics card. As of November 2018, SteamVR works well on Windows on Windows 10, has some support on macOS High Sierra and Mojave, and can work on Linux. Small models only. Large molecular structures (more than a few thousand atoms) render too slowly and will cause stuttering in the headset. Large density map surfaces also cause stuttering; a 2003 map at full resolution should work, but larger sizes may require subsampling (step 2). Current headsets render at 90 frames per second in two eyes, so the effective rendering speed needed to avoid flickering is about 200 frames per second. By comparison, a rendering speed of 10 frames per second is adequate on a conventional desktop display. Simple lighting. By default ChimeraX switches to simple lighting when VR is enabled – other lighting modes render too slowly and cause stuttering. Side View should be closed. The ChimeraX Side View tool will slow headset rendering and cause stuttering, so it should be closed during VR viewing. Blackout. Modes that perform calculations taking longer than 1/90th second cause the graphics not to update, and the VR scene will gray out after a fraction of a second without graphics updates. Changing map contour level and running molecular dynamics are prone to this problem. In the future these calculations will be done in parallel so the graphics will not be slowed down. Flickering labels. Atom labels or residue labels created by the swap amino acid mode can cause scene flicker because the labels are slow to render. Graphics optimization is needed. Selection outlines. Green selection outlines can slow rendering and cause flicker. Clipping when models far away. If models are scaled to a very large size, parts more than 500 meters away (in physical room dimensions) will be clipped. This may seem like a large distance, but as a model is scaled up it may appear to stop increasing in size because stereoscopic depth perception is not effective beyond about 10 meters. As parts of the model get both larger and farther away at the same rate, the change in size is not evident. To gauge model size, it can be useful to move a hand controller near a physical wall so that the blue mesh will provide a reference distance. Dynamic scenes may render too slowly. Dynamic (time-varying) scenes are more interesting to view than static scenes. 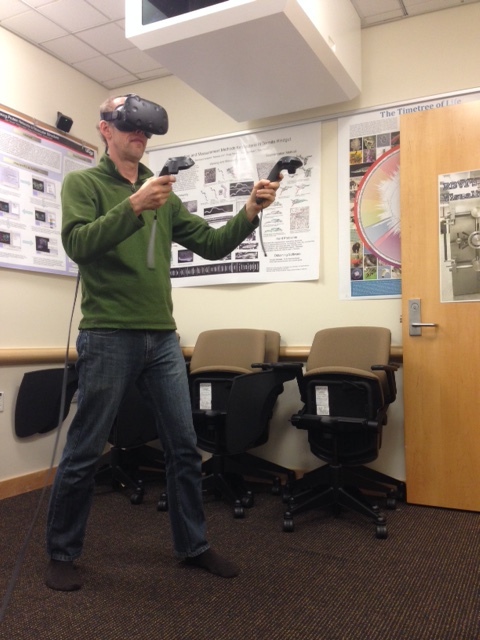 We have successfully displayed 3D optical microscopy time series of crawling cells using the command vseries play with the cacheFrames option so that all surface depictions are precomputed; without that option, the VR headset rendering is too slow. It may also help to change the scene at a slower pace, for example using vseries play with the maxFrameRate option. A molecular dynamics trajectories can be played with the coordset command. Use the coordset pauseFrames 9 option to slow the playback rate from the 90 frames per second of the headset to 10 frames per second. SteamVR room boundaries wrong. Sometimes tracing room boundaries using room-scale room setup in SteamVR produces incorrect results (November 2018). We have observed this when the traced space is not a simple rectangle because of a desk against one wall. Tracing around the desk joins the 6 corners of the bounds in the wrong order -- a different order than they were traced. It is unclear what is wrong with the SteamVR room setup algorithm. But we have found that clicking the room tracing "Advanced Mode" checkbutton which allows you to click at each corner of the room reliably produces the correct SteamVR bounds.